About £1m will be released "urgently" to the victims and survivors of the Manchester Arena attack. Twenty-two people died and 116 were injured in a suicide bombing at Ariana Grande's concert on 22 May. 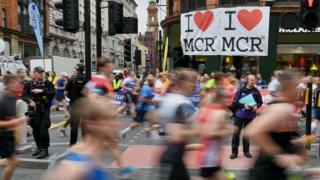 Trustees for the We Love Manchester Emergency Fund, which has raised £6.9m, agreed on Wednesday to release £1m in the first round of funding. Councillor Sue Murphy said the money would be "distributed to those who need it, and when they need it most". "We're moving quickly to ensure that the charity is set up so that it can get support out as soon as possible." The initial funds will be in addition to emergency financial aid that has already been distributed for immediate needs, including hotel bills, food and clothing. They will be released as gift payments, with no conditions on how recipients spend the money. Further funds will be given in phases, with priority given to those who have been bereaved or seriously injured, a spokesperson for Manchester City Council said. About £2m was raised in 24 hours for the fund, which has been led by Manchester City Council and the Manchester Evening News, along with the British Red Cross. More donations are expected in the coming week, including after Ariana Grande's return for the One Love Manchester concert on Sunday.